Nicotiana rustica (Aztec tobacco), like common tobacco (Nicotiana tabacum), is an allotetraploid formed through a recent hybridization event; however, it originated from completely different progenitor species. Here, we report the comparative genome analysis of wild type N. rustica (5 Gb; 2n = 4x = 48) with its three putative diploid progenitors (2.3–3 Gb; 2n = 2x =24), Nicotiana undulata, Nicotiana paniculata and Nicotiana knightiana. While Nicotiana tabacum is the most notable species from the Nicotiana genus, various other Nicotiana species are cultivated as crops, grown as ornamental garden plants or used as model organisms in research. Aztec or Indian tobacco, Nicotiana rustica, is suspected to be the original tobacco species that was brought from the Americas to Europe. Known as “mapacho”, it was considered sacred and medicinal by Amazonian shamans. Even though, in terms of production, it has been superseded in the last century by its relative N. tabacum, Aztec tobacco is still cultivated in South America, Turkey, Russia and Vietnam, mostly owing to its resilience to adverse climatic conditions. Morphologically, N. rustica is recognized for its characteristic yellow flowers that form a tube (Additional file 1: Figure S1) and leaves that are covered with trichomes rich in secondary metabolites, including nicotine, nornicotine, anatabine and anabasine . The high leaf concentration of nicotine (5–15% dry leaf weight) prompted its use in the production of nicotine-based pesticides, nicotine sulfate and nicotinic acid. Because of even higher levels of citric acid (15–20% of dry leaf weight), the leaves of N. rustica are an excellent source of this important metabolite . Scientific reports describing active accumulation of nicotine in N. rustica compared to N. tabacum are rather scarce [3, 4]. Interestingly, on the opposite to the nicotine level N. rustica exhibits a lower leaf versus root cadmium ratio compared to N. tabacum [5, 6]. As root is both involved in nicotine synthesis, cadmium uptake and shoot translocation, root pathways may have interconnection, Cd being reported to have toxic properties regarding plant nutrition [7, 8]. On the side of Cd, although Zn accumulation, but not Fe and Mn, may vary between the two species , no reports mention yet variation of K and Na. Within the Solanaceae family, the genomes of the Nicotiana species are peculiar. First, they have relatively large genomes that are similar in size to those of Capsicum species and two to three times larger than those of Solanum and Petunia species. Second, the Nicotiana genus contains many species that can be used to study the evolution of polyploidy in plants. Although the majority of the more than 70 Nicotiana species is diploid with n = 12, five sections of the Nicotiana family (Nicotiana, Polydicliae, Repandae, Undulatae and Rusticae) include allopolyploid species with n = 24 . Molecular clock analyses estimate the dates of polyploidization events as ranging from less than 0.2 million years ago (Nicotiana arentsii, N. rustica and N. tabacum) to more than 10 million years ago (a single polyploidization event from which sect. Suaveolentes is descended) [9–11]. To date, only the progenitor species of N. tabacum (Nicotiana sylvestris and Nicotiana tomentosiformis) have been well characterized , and the presence of previously identified species-specific translocations in N. tabacum [13, 14] have been confirmed . Based on morphology, cytology and artificial hybridization experiments, Goodspeed  proposed the likely progenitors of the polyploid species of the Nicotiana genus. The origins of 15 allopolyploid Nicotiana species were explored by genomic in situ hybridization (GISH) , and fluorescently labeled DNA probes from the genomes of N. undulata and N. paniculata marked the complimentary chromosomes of N. rustica, confirming Goodspeed's hypothesis of their parental relationships. Lim et al. investigated genome evolution in three natural allopolyploid species (N. arentsii, N. rustica and N. tabacum) using GISH and fluorescent in situ hybridization. Unlike in N. tabacum cultivars, no intergenomic translocations were observed in N. rustica; thus, the probes from N. undulata and N. paniculata have been exclusively mapped to the U- and P-genomes, respectively, of N. rustica. Using complementary PCR-based techniques and the internal transcribed spacer sequences of nuclear ribosomal DNA  and the chloroplast gene matK , the parental relationships of species were assessed. They provided further evidence that either N. knightiana or N. paniculata could be the maternal donor, and both techniques identified N. undulata as the paternal donor. Interestingly, N. undulata serves as a maternal donor in the hybridization with Nicotiana wigandioides, to form the allotetraploid N. arentsii [17, 19]. Unfortunately, N. knightiana was not investigated using GISH. Based on a screen of 75 Nicotiana species with several chloroplast genes, Clarkson et al. established that N. knightiana is genetically closer than N. paniculata (one vs five substitutions) to N. rustica. Nevertheless, this still suggested that a common ancestor of both N. knightiana and N. paniculata served as the maternal donor to N. rustica. Thus, to date, the identity of the progenitor species from section Paniculatae that is the maternal donor to the N. rustica genome remains unclear. Our analysis of the chloroplast genomes from all four species shed light on this topic. The genomes of Nicotiana benthamiana [20, 21], N. otophora , N. sylvestris , N. tabacum [15, 22], N. tomentosiformis , N. attenuata  and N. obtusifolia  have been sequenced and draft assemblies published, enabling genome-based evolutionary studies of Nicotiana species. With the exception of N. benthamiana, N. attenuata and N. obtusifolia, all of the published Nicotiana genomes are closely related to N. tabacum. Here, we present the genomes and transcriptomes of N. rustica and its putative ancestral species, N. undulata, N. paniculata and N. knightiana. We elucidate the mechanism behind the upregulated nicotine production in these plants and provide insights into the metabolic and genomic differences in comparison with N. tabacum and its ancestors, N. sylvestris and N. tomentosiformis, also focusing on the accumulation of essential and non-essential elements as well as major free amino acids, no studies being available yet. We sequenced the genomes of N. rustica and its potential progenitors, N. undulata, N. paniculata and N. knightiana, using reads from Illumina HiSeq2500 and Pacific Biosciences RSII sequencers and performed de novo genome assemblies. The estimations of their genome sizes based on 31-k-mer depth distributions of raw sequencing reads were 4.99 Gb for N. rustica, 2.18 Gb for N. undulata, 3.26 Gb for N. paniculata and 3.12 Gb for N. knightiana, which are consistent with the sizes (5.181, 2.362, 2.880 and 3.090 Gb, respectively) reported in the KEW c-DNA database. Based on these numbers, the genome of N. rustica was reduced by 5.9 or 8.3% compared with the sum of the genome sizes from N. undulata and either N. paniculata or N. knightiana, respectively. This reduction corresponds to the upper bound proposed by Leitch et al. and is similar to the reduction in genome size reported for N. tabacum . The assembled genome sequences consisted of 117,559 to 246,567 scaffolds, covering from 67.2 to 89.2%, respectively, of the estimated genomes. The N50 lengths were between 52.8 and 84.6 kb (Table 1). The comparatively low k-mer-based genome coverage of N. paniculata (67.2%) results from the overestimation of its genome size when using 31-k-mers. While the estimation methods produced similar genome sizes for the other species, this was not the case for N. paniculata, for which flow cytometric measurements resulted in a smaller estimated genome size. An analysis of the assembled genomes organization showed that 22 to 25% of the sequenced genomes consisted of genes and regulatory sequences (Table 1). The 75 to 78% of the genomes identified as repeats consisted, to a large extent, of long terminal repeat elements (~ 45% of the genome assemblies). The proportions of each type of repeat element found in N. rustica, N. undulata, N. knightiana and N. paniculata were very similar. They also correspond to those previously observed in N. tabacum and its ancestors [12, 15]. Lim et al. [18, 24] used GISH and fluorescent in situ hybridization to detect rearrangements and at least 10-fold reductions in the NPAMBO repeat content within the P-genome of N. rustica compared within that of N. paniculata. Based on the draft genome assemblies, no such reduction in the NPAMBO repeat element was observed (Additional file 2: Table S1). The completeness of the genomes was assessed using Benchmarking Universal Single-Copy Orthologs (BUSCO) with the embryophyta plant dataset, which consists of 1440 universal single-copy orthologs . Additional file 3: Figure S2 shows the percentage of these universal single-copy orthologs that were identified as complete, duplicated, fragmented and missing in Nicotiana genomes, other Solanacea genomes, Vitis vinifera and Arabidopsis thaliana. Most diploid Nicotiana species contain approximately 95% complete universal single-copy orthologs (approximately 90% as single copies and 5% as duplicates), similar to other diploid Solanacea species and A. thaliana. N. otophora is the only exception, with approximately 75% single copied and 5% duplicated complete universal single-copy orthologs. It also contains approximately 10% fragmented universal single-copy orthologs, which is higher than in the other genomes. The tetraploid Nicotiana species also contain approximately 95% complete universal single-copy orthologs. However, the proportions of single copies and duplicates are very different, with only approximately 30% of single copies complete universal single-copy orthologs being contained in the recent tetraploids N. tabacum and N. rustica, and approximately 50% in the more ancient tetraploid N. benthamiana. 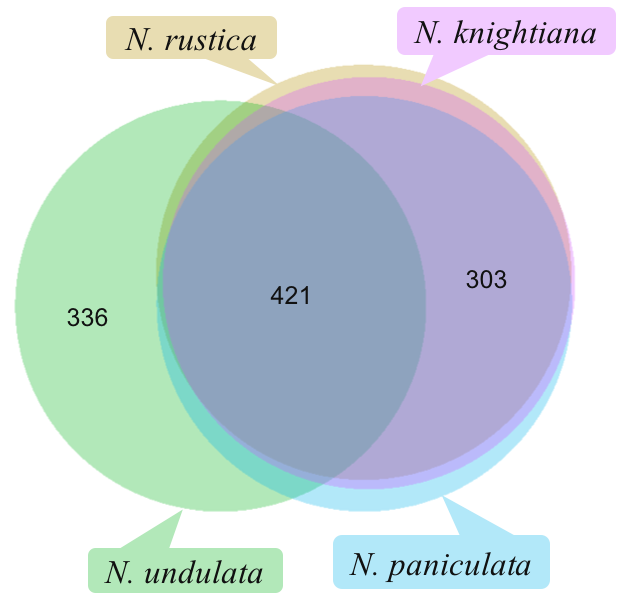 The 31-k-mers present in the raw sequencing reads of N. rustica, N. undulata, N. paniculata and N. knightiana between 5 and 250 times were compared to evaluate the overlap among the four species (Fig. 1a). Approximately 50% of them are unique to one species and only 2% are common to all four species; 18% are common to N. rustica and N. undulata, and 26% to N. rustica and N. paniculata and/or N. knightiana (12% with both species, 8% with N. knightiana and 6% with N. paniculata). Of the 31-k-mers found in the N. rustica raw reads (Fig. 1b), 25% are unique to N. rustica, 29% are shared with N. undulata, and 41% with N. paniculata and/or N. knightiana. The proportion of 31-k-mers found in one of the two ancestors indicates that 41.4% of the N. rustica genome originated from N. undulata and 58.6% from N. paniculata and/or N. knightiana, which is consistent with the genome contributions of each ancestor to the hybridization (40.6 and 59.4%, respectively, calculated using predicted genome sizes of 2.18 Gb for N. undulata, 3.19 Gb for N. paniculata/N. knightiana (average of the predicted 3.12 Gb and 3.26 Gb genome sizes), and 5.37 Gb for N. rustica at the time of hybridization). Based on an estimated N. rustica genome of 4.99 Gb, the 41.4% contributed by N. undulata accounted for 2.07 Gb (0.11 Gb downsizing from the estimated N. undulata genome size), and N. paniculata and N. knightiana accounted for the remaining 2.92 Gb (0.27 Gb downsizing from the average of the estimated N. paniculata and N. knightiana genome sizes). In comparison, in N. tabacum, the 31-k-mer analysis showed that 40.3% of the genome originated from N. tomentosiformis and 59.7% from N. sylvestris, whereas the estimated genome sizes of the ancestors indicated contributions to the hybridization of 46.2 and 53.8%, respectively, calculated with genome sizes of 2.22 Gb for N. tomentosiformis and 2.59 Gb for N. sylvestris, and 4.81 Gb for N. tabacum at the time of hybridization. Based on an estimated N. tabacum genome size of 4.41 Gb , the 40.3% contributed by N. tomentosiformis accounted for 1.78 Gb (0.44 Gb downsizing from the estimated N. tomentosiformis genome size), and N. sylvestris accounted for the remaining 2.63 Gb (0.04 Gb upsizing from the estimated N. sylvestris genome size) . The maternal parent of the tetraploid N. rustica was identified as being the ancestor of N. paniculata and N. knightiana by mapping the short sequencing reads from N. rustica and its ancestors to the chloroplast genome of N. tabacum  and by assessing the number of single nucleotide polymorphisms (SNPs) shared between N. rustica and N. undulata, and between N. rustica and N. paniculata and/or N. knightiana. Additional file 4: Figure S3 shows the overlap of the chloroplast genomes from the four Nicotiana species based on the number of common SNPs. We observed 336 SNPs unique to N. undulata, 8 shared between N. rustica and N. undulata, 303 SNPs shared by N. rustica, N. paniculata and N. knightiana, 7 by N. rustica and N. paniculata, 17 by N. rustica and N. knightiana and 11 by N. paniculata and N. knightiana. The chloroplast genome of N. knightiana appears to be closer than that of N. paniculata to the N. rustica chloroplast genome. For each species, samples were taken from various organs under different conditions and at different time points. For N. rustica, two sets of transcriptomes were generated, one including eight tissues at a single time point, (flower bud, mature flower, mature capsule, lower leaf, middle leaf, upper leaf, stem and root) and the other one containing only root, upper and lower leaves and flower. For the putative progenitors, only the four-tissue set was generated. Expressed gene families were assigned using OrthoMCL. The gene families from the four-tissue set were used to ensure the comparability of datasets. As shown in Fig. 2, there is a common core of 14,623 ortholog groups that is shared by all species. As evidenced by the 207 ortholog groups specific to N. rustica, it has experienced only a minor divergence, as have the pseudo-progenitor species, each having fewer than 62 exclusive ortholog groups. N. rustica shares 1037 ortholog groups exclusively with N. undulata. Because N. paniculata and N. knightiana have diverged from the most recent common ancestor, the share of exclusive common orthologs is split between the two pseudo-progenitors, and N. paniculata appears closer to N. rustica (711) than N. knightiana (470 groups). No potential regulators or genes of the nicotine biosynthesis pathway were identified in clusters of orthologous genes that are specific to either N. tabacum or N. rustica based on annotation assigned by blastp searches against TAIR and ITAG proteins, as well as against key regulators and genes of the nicotine biosynthesis pathway. 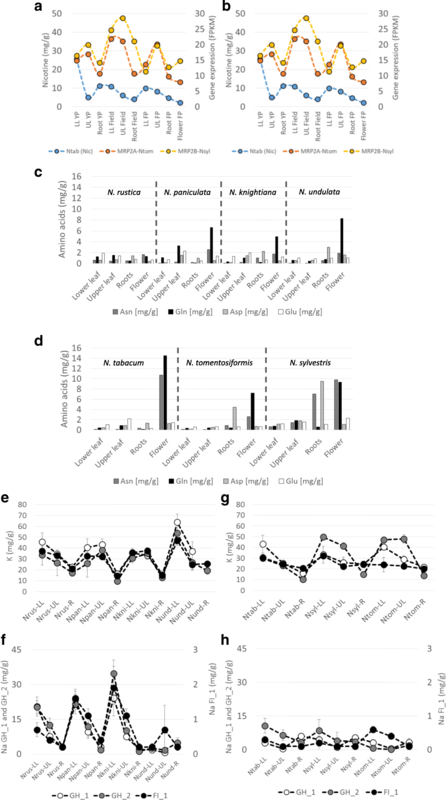 Similarly, no potential regulators or genes of the nicotine biosynthesis pathway were identified in clusters of orthologous genes that are shared between N. rustica and N. undulata, or N. rustica and N. paniculata and/or N. knightiana, that could have provided insights on the maternal and paternal progenitors impact on the alkaloid pathway. To obtain a gene set for the phylogenetic analysis, OrthoMCL was run using the groups mentioned above, as well as the ancestors of tobacco, N. sylvestris and N. tomentosiformis, with tomato as an outgroup. A core set of 12,401 ortholog groups is shared among the species. Of these, 3041 have a group composition that corresponds to the expectations of polyploidization: one group member for the diploid species and two members for the allotetraploids. These can be aligned and used to calculate phylogenetic properties. A filtered subset of 2951 groups showed that 1250 N. rustica genes clustered with genes from N. knightiana, 1048 N. rustica genes clustered with genes from N. paniculata, and 653 N. rustica genes clustered with genes from the common ancestor of N. knightiana and N. paniculata. This result supports the earlier observation, based on the chloroplast genome SNP analysis, that N. knightiana is closer to N. rustica than N. paniculata and corroborates the phylogenic tree constructed by Sarkinen et al. . The alkaloid pattern was species dependent and consistent among the biological replicates of plants cultivated in greenhouse and field (Table 2). Under all conditions, N. rustica contained more nicotine in the upper and lower leaves compared with all of the other species. N. paniculata, N. knightiana and, to some extent, N. undulata showed high nicotine to nornicotine conversion rates in the roots, which was not the case for N. rustica. However, N. rustica contained a higher level of anatabine compared with its progenitors. In Nicotiana species, the core of the alkaloid pathway consists of 8 enzymes leading to the biosynthesis of nicotine and nornicotine. Starting from putrescine, putrescine N-methyltransferase (PMT) and N-methylputrescine oxidase (MPO) are responsible for the formation of the pyrrolidine ring of nicotine, while the pyridine ring if formed from aspartate by aspartate oxidase (AO), quinolinate synthase (QS) and quinolinate phosphoribosyl transferase (QPT). A622 and berberine bridge enzyme-like (BBL) oxidoreductases are then involved in the coupling of the two rings to form nicotine. Nicotine is further demethylated by nicotine N-demethylase (NND/CYP82E) to nornicotine. The jasmonate-inducible ERF189 and ERF199 factors are key regulators of the nicotine biosynthesis pathway in N. tabacum. The jasmonate signaling bHLH-family transcription factor MYC2, regulates the nicotine pathway genes by interacting with ERF189 and ERF199, and by directly binding to G box elements found in their promoters . The alkaloid levels are shown in Fig. 3 in the context of the alkaloid pathway, and the expression of the alkaloid pathway genes and key regulators at the different sampling times and in the different tissues are shown in Fig. 4. For each enzyme of the alkaloid pathway, the copy numbers of the encoding genes and their expression levels in the various organs were analyzed in N. rustica, N. tabacum and their respective ancestors to identify changes, which could explain differences in alkaloid accumulations. An additional putrescine methyltransferase (PMT) gene was identified in the N. rustica genome in comparison with the N. tabacum genome (Additional file 5: Figure S4a). From the six PMT genes identified in N. rustica, four (PMT-2, -3, -5 and -6) have homologs in N. undulata (PMT-1, -2, -3 and -4, respectively), and the two others (PMT-1 and -4) likely originated from a single gene in N. knightiana/N. paniculata (PMT-1). Interestingly, the PMT sequences from N. rustica and their corresponding progenitors, except PMT-2, slightly diverged from N. tabacum sequences, as shown in Additional file 5: Figure S4a. In comparison, only four PMT genes were identified in N. tabacum as published by Riechers and Timko  and deposited in the Uniprot database. Three (PMT-2, -3 and -4) have homologs in N. sylvestris (PMT-1, -2 and -3), and one (PMT-1) in N. tomentosiformis (PMT-1, based on intron and promoter sequence comparisons; data not shown). In N. tomentosiformis, a second copy close to PMT-1 is present (PMT-2). In the N. tabacum genome, an additional small PMT fragment was also found, likely originating from the N. tomentosiformis PMT-1 copy. At the transcriptional level, the PMT genes were expressed almost exclusively in roots . In N. rustica, only five PMT genes (PMT-1, -3, -4, -5 and -6) were expressed under our experimental conditions, while PMT-2 and its homolog in N. undulata (PMT-2) were silent. In N. tabacum, the four PMT genes (PMT-1, -2, -3 and -4) were expressed. In N. tomentosiformis, the second copy (PMT-2) was not expressed under our experimental conditions. This lack of expression could result from the two-fold reduction of putative binding sites for transcription factors in the promoter of PMT-2 (based on JASPAR predictions) . Because PMT is a key gene in nicotine metabolism , the addition of one more expressed gene in N. rustica compared with N. tabacum may increase nicotine biosynthesis in N. rustica. Based on the data presented in Additional file 5: Figure S4a, we hypothesize that a main difference between N. rustica and its progenitors is the root-to-shoot transport of nicotine. Nornicotine is generated through the N-demethylation of nicotine, which involves cytochrome P450 nicotine N-demethylases (NNDs). In tobacco leaves, three active enzymes, CYP82E4, CYP82E5 and CYP82E10, have been identified . As shown in Fig. 3, the nornicotine content may vary between N. rustica and its progenitors, as well as between N. tabacum and its progenitors. The nornicotine content is particularly abundant in the roots of N. rustica progenitors as compared with that in the lower leaves of N. rustica (five to nine times more elevated) and with N. sylvestris (two times more abundant compared with upper leaves and roots) (Fig. 3). To determine whether a correlation exists between gene expression and the nornicotine content, a phylogenetic tree based on sequences and sequence fragments identified in the genomes was generated. A large number of translated sequences encoding CYP82E genes, nine in N. rustica, eight in N. paniculata, six in N. knightiana, seven in N. undulata, 17 in N. tabacum, 10 in N. sylvestris and seven in N. tomentosiformis, were found. Nornicotine is approximately five, eight and nine times more elevated in the roots of N. undulata, N. paniculata and N. knightiana, respectively, than in the roots of N. rustica. This is in agreement with the reduced expression levels of the two N. rustica NND genes, NND2 (10.25 fragments/kb/million mapped reads [FPKM]) and NND7 (10.53 FPKM), compared with their corresponding progenitor genes in N. paniculata, NND1 (166.88 FPKM) and NND4 (127.4 FPKM), N. knightiana, NND1 (145.69 FPKM), and N. undulata, NND7 (33.01 FPKM). Furthermore, N. undulata and N. paniculata also have one more expressed gene each, NND1 (33.88 FPKM) and NND2 (96.85 FPKM), respectively, which are not present in N. rustica. The observations made at the transcriptional level were valid under field and greenhouse conditions. Thus, both the reduced expression levels of the N. rustica NND accessions compared with the corresponding progenitor accessions, and the presence of additional transcripts in N. rustica progenitors may contribute to the elevated nornicotine concentrations in the roots. In N. sylvestris, nornicotine is approximately two and five times more abundant than in N. tabacum in the lower and upper leaves, respectively (Fig. 3). This observation was correlated with the higher transcript levels of N. sylvestris NND7 (CYP82E2), NND1 (CYP82E10) and NND9 compared with the corresponding genes in N. tabacum, NND9 (CYP82E2), NND3 (CYP82E10) and NND17, respectively (Additional file 5: Figure S4b). We have to consider as well that mutations play a role for the activity of NNDs, as demonstrated for CYP82E2 and CYP82E3 not being active in N. tabacum . The transport of both anatabine and nicotine from root-to-shoot increased in both N. rustica and N. tabacum compared with their progenitors, particularly for mature plants grown in the greenhouse and field (Table 2). This suggests that the improved transport of both alkaloids may result from the combination of the progenitor genome after the allotetraploid formation. Because all alkaloid transporters are not yet identified in plants, particularly the transporter(s) controlling nicotine translocation from root-to-shoot , we looked at genes being co-expressed with anatabine and nicotine profiles. For this purpose, we calculated the correlations between the expression levels of every gene with the alkaloid concentrations across all tissues, and selected the most highly correlated for a more detailed inspection. For anatabine, no transcripts with high correlations were found; however, the transcripts of two ABC transporters, named MRP2A and MRP2B owing to their high homology with Arabidopsis multidrug resistance-associated protein 2 (MRP2, AtABCC2), exhibited high correlations (0.96 and 0.93, respectively) with nicotine in N. rustica (Fig. 5). MRP2A is from the N. undulata progenitor, and MRP2B is from the N. paniculata or N. knightiana progenitor. In Arabidopsis, AtABCC2 (MRP2) has two different activities: (1) in association with AtABCC1, AtABCC2 confer tolerance to cadmium and mercury, in addition to their role in arsenic detoxification, possibly involving phytochelatin detoxification process [34–37] (2) this ABC transporter is also involved in vacuolar transport of chlorophyll catabolites . In contrast to N. rustica, MRP2A and MRP2B transcript profiles were not correlated with nicotine in N. tabacum TN90. MRP2A was inherited from the N. tomentosiformis progenitor and MRP2B from the N. sylvestris progenitor. These data suggest that the activities of N. rustica MRP2 genes may be triggered by the nicotine content or play a role in the nicotine root-to-shoot transport of N. rustica specifically. In both progenitors of the allotetraploids N. rustica and N. tabacum, MRP2 transcript profiles exhibited no correlation with the nicotine profiles (data not shown), suggesting that the synchronization of MRP2A and MRP2B transcripts with nicotine occurred after the hybridization of parental genomes. Glutamate, Gln, aspartate and asparagine are central regulators of nitrogen assimilation, metabolism and transport. In both N. rustica and N. tabacum progenitors, Gln is abundant in the flowers of greenhouse-cultivated plants. Similarly high levels of Gln are also found in N. tabacum but not in N. rustica (Fig. 5). Gln synthesis is dependent on the glutamate synthetase (GS) activity, which plays an essential role in nitrogen metabolism. The enzyme catalyzes the condensation of glutamate and ammonia to form Gln. We identified 9 and 10 different GS genes in N. rustica and N. tabacum, respectively, all of which were expressed. A phylogenetic tree grouped the GS genes into four clusters (Additional file 5: Figure S4c), independent of the Nicotiana species, thereby indicating the importance of sequence conservation during evolution. The expression data aligned with the gene clustering, highlighting the correlation between structure and function in this gene family. Additionally, expression data helped to identify the candidate genes responsible for the regulation of Gln formation in flowers (Cluster I). Indeed, N. knightiana GS-1 and its homolog N. paniculata GS-4 are more than eight times more highly expressed in flowers than the corresponding genes of N. rustica (GS-3), whereas N. undulata GS-5 is more than four times more highly expressed than the corresponding gene of N. rustica (GS-7). However, the reason for the lower expression levels of N. rustica GS-3 and GS-7 than the corresponding progenitor genes remains obscure. The orthologous genes of N. tabacum (GS-8 and GS-10, respectively) belonging to the same cluster are less downregulated (< 2.5×) than the corresponding genes in N. tomentosiformis (GS-3) and N. sylvestris (GS-4). In addition, N. sylvestris GS-4 has an additional copy in N. tabacum (GS-6) which may contribute to there being more Gln in N. tabacum than in N. rustica flowers. All of these clustered genes, which are particularly expressed in non-photosynthetic tissues, like flowers and mature roots, are cytosolic GS1s that are involved specifically in the remobilization of nitrogen for seed feeding . The observations made above for GS are not applicable for asparagine synthetase (ASN, data not shown), although the amino acid data suggested strong ASN activities in roots and flowers of N. sylvestris and in flowers of N. tabacum compared with other tissues, and with N. rustica and N. rustica progenitors. This may be because asparagine synthesis depends on multiple factors, like the size of the Gln and aspartate pools, as well as the level of ATP as an energy source [39, 40], and not just gene activation. N. rustica accumulates less cadmium (Cd) in leaves than N. tabacum under hydroponic conditions and at relatively high Cd concentrations (1 μM) . In the data presented in Additional file 2: Table S2, under field and greenhouse conditions, no major differences were found, confirming previously published data , suggesting that leaf Cd accumulation is different when N.rustica and N.tabacum are grown under non- or Cd contaminated soils. Therefore it is not surprising to find no significant correlation between nicotine and cadmium in our dataset, soil used in the depicted experiments being low in Cd. However, this doesn’t exclude that Cd may interfere with nicotine synthesis or transport in high Cd contaminated soils or artificial nutrient solutions, therefore possibly involving homologous AtABCC2 genes [34–37]. We also determined the concentrations of other metals and ions. For instance, N. rustica accumulated more arsenic in the root compared to N. tabacum, particularly under greenhouse condition. This observation is possibly correlated with the accumulation of sulfur in N. rustica and its ancestor N. knightiana, sulfur being known to play a role in the arsenic detoxification via the production of glutathione and glutathione-S-transferase  or even phytochelatins. In this respect, ABCC2 homologs are also possibly involved in some detoxification process . The data on potassium (K) and sodium (Na) levels showed that, independent of the environmental growth conditions, the accumulation profiles in both roots and leaves were similar under greenhouse and field conditions in N. rustica and N. rustica progenitors, and much higher than in N. tabacum and its progenitors. This suggests that in N. rustica the maintenance of K and Na homeostases is robust and crucial for growth. However, this observation is less valid for N. tabacum and its progenitors, which showed more variation in K in greenhouse flowering leaves (GH_2, Fig. 5), and for Na in N. tomentosiformis in field leaves (Ntom-UL and Ntom-LL, Fig. 5), suggesting that K and Na may be subjected to more plasticity in N. tabacum and its progenitors. 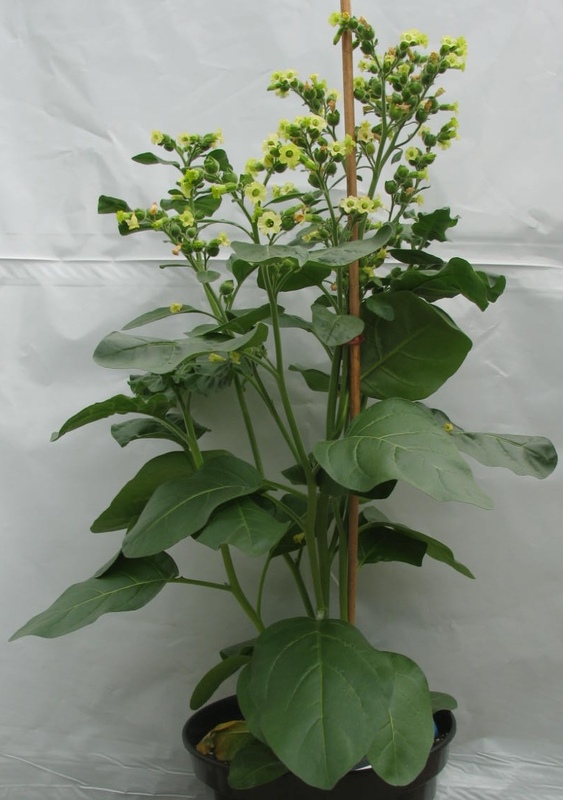 Following the publication of the genome of N. tabacum and its progenitors, a second, independent, set of genomes containing a tetraploid Nicotiana species, N. rustica, and its progenitors is available to investigate the impact of speciation by hybridization of two diploid species. Unlike in N. tabacum, no intergenomic translocations were observed in N. rustica. Those present in N. tabacum are hypothesized to be the result of the wider divergence between the parental genomes of N. sylvestris and N. tomentosiformis compared with those of N. rustica, which has relatively close parental genomes from N. undulata and Nicotiana section Paniculata. It is possible that the similar parental genomes of N. rustica exert a lower “genomic stress” , resulting in less selection pressure and, therefore, less intergenomic translocations. Despite not giving a final answer regarding the sequence of evolutionary events leading to the speciation of N. rustica, N. paniculata and N. knightiana, the genome sequences of the progenitors of N. rustica also indicate that N. knightiana is more closely related to N. rustica than N. paniculata. 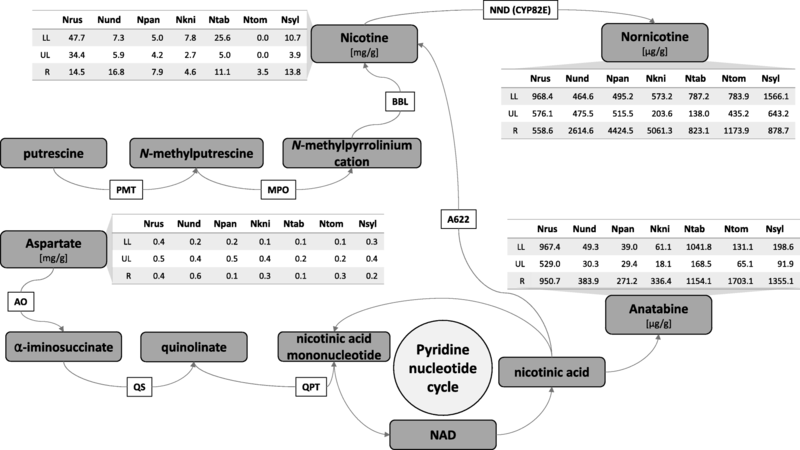 Focusing on the mechanism behind the upregulation of nicotine production in N. rustica provided insights into the metabolic and genomic differences in comparison with N. tabacum and its progenitors. Compared with its progenitors and with N. tabacum and its progenitors, N. rustica contained more nicotine in the upper and lower leaves. Our data suggests that nicotine level in N. rustica results more of a genome combination of the ancestors than in N. tabacum, N. tomentosiformis exhibiting rather low nicotine in both root and leaves compared to N. sylvestris. Interestingly, N. sylvestris has three active copies of PMT, one of the key root expressed gene involved in nicotine synthesis, whereas N. tomentosiformis has only one. Therefore, four active PMTs were identified in N.tabacum, and five in N. rustica, for whom the genetic origin of the ancestors is more complex to draw. In addition to more active synthesis, the elevated nicotine content in N. rustica compared to N. tabacum may also results from a more active transport to the shoot via an ABC transporter, its expression being correlated with nicotine in N. rustica. The nicotine to nornicotine conversion rates in the roots of N. paniculata, N. knightiana and, to some extent, N. undulata was high, which was not the case for N. rustica, which contained higher levels of anatabine compared with its progenitors. Regarding the nicotine conversion, it does not seem to derive from a simple additive gene effect, nornicotine levels being generally higher in the ancestors compared to both N. rustica and N. tabacum. This suggests some regulatory processes to occur at the CYP82E transcript level. Based on our data, no interconnection between Cd uptake and nicotine synthesis as well as shoot translocation can be established. Similar experiments should be performed using Cd contaminated soils. In this context, ABBC2 (MRP2) homologous genes may play a role in interfering between nicotine and Cd accumulation, AtABCC2 carrying already different substrate affinity [34–37]. About two times more asparagine and glutamine were found in the flower of N. tabacum compared to N. rustica suggesting a more efficient remobilization of carbon and nitrogen resources, possibly supported by different glutamine synthase activities. Finally, N. rustica accumulates more sulphur than N. tabacum particularly in the above ground organs which may support arsenic and cadmium detoxification under certain growth conditions. In addition, K and Na homeostases seem to be particularly well-controlled in N. rustica compared to N. tabacum for the maintenance of growth. 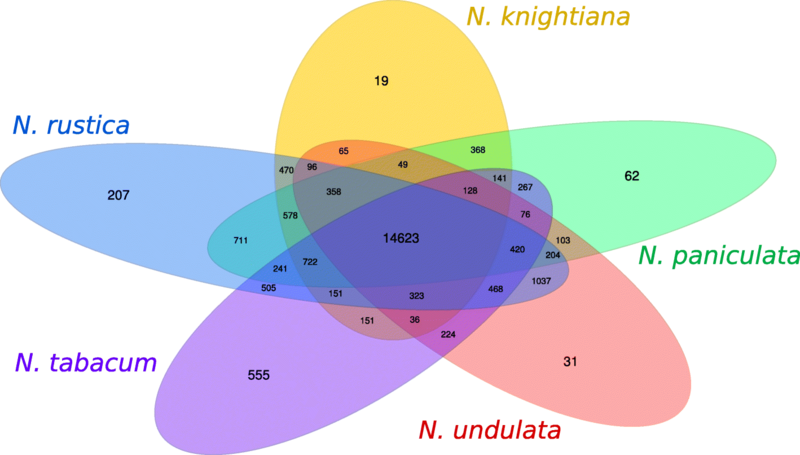 The comparative genome analysis of four related Nicotiana genomes showed that the tetraploid species N. rustica inherited about 41% of its genome from its paternal progenitor, N. undulata, the rest originating for its maternal progenitor, the common ancestor of N. paniculata and N. knightiana. Analysis of the genome sequences of the progenitors of N. rustica indicated that N. knightiana is more closely related to N. rustica than N. paniculata, although the sequence of evolutionary events leading to the speciation of N. rustica remain to be elucidated. N. rustica contained more nicotine in the upper and lower leaves than its progenitors, this nicotine level likely being the results of the genome combination of the progenitors. A more active transport of nicotine to the shoot via an ABC transporter in N. rustica may also contribute to the elevated nicotine content in N. rustica compared to N. tabacum in addition to the presence of one more additional PMT copy in the N. rustica genome. The availability of these new set of related Nicotiana genome sequences, will significantly contribute to better understanding the impact of speciation and the evolution of tetraploid Nicotiana species. N. rustica L. var. Brasilia No. 7 (PI 499174, TR13, USDA–GRIN database), N. paniculata L. (PI 555545, TW 99, USDA–GRIN database), N. knightiana Goodsp. (PI 555527, TW 73, USDA–GRIN database), N. undulata Ruiz & Pav. (PI 555575, TW 146, USDA–GRIN database), N. tabacum L. cv. TN90 (PI 543792, TC 586, USDA–GRIN database), N. sylvestris Speg. & Comes (PI 555569, TW 136, USDA–GRIN database) and N. tomentosiformis Goodsp. (PI 555572, TW 142, USDA–GRIN database) were used in the experiments. Seeds were sown on soil. For the field experiment, plants were transferred after 3 weeks into soil-containing floating trays (floating tray solution: Hauert Plantaaktiv 15 + 7 + 22; Hauert, Grossaffoltern, Switzerland). Plants were grown for six more weeks in hydroponics before being transferred to the field. For the greenhouse experiment, plants were directly transferred to pots. The solutions used for the fertilization of soil-grown plants were purchased from Yara Benelux B.V. (Vlaardingen, The Netherlands) and contained (per liter): 605.62 mg NO3, 13.29 mg NH4 (total of 147.77 mg N), 65.56 mg P2O5, 275.44 mg K2O, 35.89 mg Mg, 133.26 mg Ca, 265.35 mg SO4, 0.516 mg Fe, 0.338 mg Mn, 0.201 mg Zn, 0.199 mg B, 0.029 mg Cu and 0.03 mg Mo. All of the plants were grown in a 16-h light:8-h dark cycle. First time points for plant sampling took place after 10 weeks of growth. At this time point, N. rustica and N. paniculata were already flowering, and N. knightiana and N. sylvestris were starting to flower. Next, plants were sampled again at a second time point when fully flowering. N. rustica, N. paniculata, N. knightiana and N. sylvestris were sampled after 12 weeks of growth, N. tabacum and N. undulata after 14 weeks and N. tomentosiformis was transferred to a 9-h light:15-h dark cycle to induce flowering and then sampled after 21 weeks. The field experiment was conducted in Switzerland (Vaud). Prior to the field experiment, soil samples were taken to a depth of 30 cm, and mixed and analyzed by Sol Conseil (Changins, Switzerland). Furthermore, shortly before transplanting, an additional soil sample (30-cm depth) was analyzed for nitrogen content (Service de l’agriculture, Agrilogie, Grange-Verney, Moudon, Switzerland). The soil was composed of 14.1% clay, 35.5% silt and 50.4% sand, containing 1.8% organic matter, with a pH of 8.0. The soil contained 140 mg kg− 1 soluble Ca and, as determined by ammonium acetate-EDTA extraction, 27.0 mg kg− 1 P, 157.6 mg kg− 1 K, 50,234 mg kg− 1 Ca and 361.7 mg kg− 1 Mg. The total N was 25.9 kg ha− 1, composed of 23.2 kg ha− 1 N-NO3 and 2.7 kg ha− 1 N-NH4. The field was fertilized according to tobacco cultivation practices with K2SO4 [450 kg ha− 1 50% + S; Landor (Birsfelden, Switzerland)], superphosphate [239 kg ha− 1 18 P-4 Mg; Landor (Birsfelden, Switzerland)] and nitrochalk [97 kg ha− 1 total 15.5–0-0; Yara Benelux B.V. (Vlaardingen, The Netherlands)]. During the season, precipitation was measured using a rain gauge. Temperature was obtained from the nearest weather station (MétéoSuisse). The growing season was relatively dry and hot. The temperature exceeded 30 °C on 23 days (maximum of 37.9 °C) and 144 mm of rainfall were recorded. The field was irrigated twice with a total of 45 mm of water. Plants were grown in a random design. Four plants per species were harvested 80 days after transplantation. Plants were at a different physiological stages, depending on the plant species. While N. rustica, N. paniculata, N. knightiana and N. sylvestris were flowering, N. tabacum, N. undulata and N. tomentosiformis were not yet flowering. N. tomentosiformis grew very poorly in the field. Total plants, including roots, were harvested and processed as described below (section “Plant sampling”). Roots were separated from shoots and washed with water until clean. Roots were dried with paper and flash-frozen in liquid nitrogen. They were ground in liquid nitrogen and some of the material was used for RNA extraction. Some ground root material was lyophilized and then analyzed for alkaloid, amino acid and elemental compositions. One or more leaves positioned on the lower stalks (depending on leaf size) were harvested for each plant and leaves were cut in halves (without the midrib). One half was frozen in liquid nitrogen for RNA analysis and the other half-leaf was lyophilized and analyzed for alkaloid and elemental compositions. One or more leaves positioned on the upper stalks were similarly processed. The leaf materials for RNA extractions were ground in liquid nitrogen. Four plants were analyzed for each variety and condition. Values are means ± standard deviations of four replicate plants. When the value was below the limit of reporting, the reporting limit was used for the calculation. Owing to insufficient materials being available for collection at the first sampling time point in the greenhouse, only two N. paniculata root samples, three N. sylvestris root samples and no N. undulata root samples were analyzed for elemental composition. However, all of the samples were analyzed for alkaloids and amino acids. The elemental composition of the samples was analyzed by ALS Life Sciences (Praha, Czech Republic). Samples were homogenized and mineralized by acids and hydrogen peroxide prior to analysis (CZ_SOP_D06_02_J02 chap. 10.17.1, 10.17.2, 10.17.4, 10.17.7, 10.17.8). As, Cd, Cr, Cu, Pb, Ni and Zn were measured by mass spectrometry with inductively coupled plasma according to CZ_SOP_D06_02_002 (US EPA 200.8, CSN EN ISO 17294-2). The elemental composition always refers to plant dry weight. All other elements were measured by inductively coupled plasma atomic emission spectroscopy according to CZ_SOP_D06_02_001 (US EPA 200.7, ISO 11885). Weighed aliquots (~ 25 mg) of lyophilized and pulverized plant materials were extracted with 1.8 mL of 0.1 N HCl at 90 °C for 1 h. After centrifugation, 120 μL aliquots of the supernatants were mixed with 800 μL MeCN, 40 μL of 0.33 M sodium acetate solution; and centrifuged again in a solution of isotopically labelled internal standards (215 μg/mL K15NO3; 2.0 μg/mL nornicotine-d4; 40 μg/mL nicotine-d4; 1.0 μg/mL anatabine-d4; and 10 μg/mL asparagine-15N2; in MeOH). The supernatants were analyzed by LC-MS on an Ultimate 3000 UHPLC system coupled to a Q-Exactive mass spectrometer (Thermo Fisher Scientific). Chromatographic separation was performed on an Acquity UPLC BEH Amide column (1.7 μm, 150 × 2.1 mm; Waters), and the column temperature was set to 20 °C. Eluents were aqueous ammonium formate (2 mM) with added formic acid (0.25% v/v; eluent A) and MeCN with added formic acid (0.1% v/v; eluent B) applied as a gradient (0 min–6% A; 0.5 min–6% A; 4.0 min–60% A; 4.5 min–60% A; flow: 0.5 mL/min). The injection volume was 0.7 μL. Nitrate, nicotine, anatabine, nornicotine, glutamic acid, Gln, aspartic acid and asparagine were eluted after 1.15, 3.16, 3.23, 3.32, 4.00, 4.10, 4.16 and 4.20 min, respectively. For MS detection, electrospray ionization was applied with capillary voltages of 3.7 and 2.0 kV in positive and negative modes, respectively. The nitrate ion was detected in the negative mode, while nicotine and the amino acids were detected as [M + H]+ pseudomolecular ions in the positive mode. For the detection of anatabine, the m/z 25 fragment was used after collision-induced fragmentation of the m/z 158 ion in the positive mode. For quantification, the respective isotopically labeled internal standards were used for nitrate, nicotine, anatabine and asparagine. Aspartic acid, Gln and glutamic acid were quantified by external calibration. DNA extractions were performed on the aerial parts of one plant per variety using the Qiagen DNAeasy Plant Maxi Kit (Qiagen, Hilden, Germany). Short insert “paired-end” libraries were prepared using the Illumina TruSeq DNA Sample Preparation Kit version 2 (Illumina, San Diego, CA). Long insert “mate-pair” libraries were prepared according to the Nextera Mate Pair Library Prep Kit (Illumina, San Diego, CA). All of the libraries (Additional file 2: Table S3) were sequenced on an Illumina HiSeq-2500 using version 3 chemistry and flow-cells with runs of 2 × 100 bases. Base calling and sample demultiplexing were performed using Illumina HiSeq Control Software and the CASAVA pipeline software. For N. rustica, 5- and 10-kb-long read libraries were prepared and sequenced on a Pacific Biosciences RSII. The genome sizes were estimated using the 31-k-mer depth distribution of all paired-end sequencing libraries, as described previously. Briefly, the genome sizes were obtained by dividing the total number of 31-k-mers considered to be error-free by their most frequent depths of coverage. Raw paired-end DNA reads were preprocessed with Trimmomatic (http://www.usadellab.org/cms/?page=trimmomatic) to remove sequencing adapters and low quality reads from the 5′ and 3′ ends of the reads, and to discard reads shorter than 50 bp. Raw mate-paired DNA reads were preprocessed with NxTrim (https://github.com/sequencing/NxTrim) to separate them into mate-pairs and paired-ends based on the presence of the Nextera adapter. The clean reads were then assembled into contigs using SOAPdenovo2 (http://soap.genomics.org.cn/soapdenovo.html) with a k-mer of 63 and scaffolded by increasing library size. Gaps resulting from the scaffolding were closed using GapCloser (http://soap.genomics.org.cn/soapdenovo.html), and all sequences shorter than 200 bases were discarded from the final assemblies. After closing the gaps, singletons were used as queries in a BLAST-based algorithm against the scaffolds. They were eliminated if the match level was greater than 97% to avoid artificial duplications of short sequences. Long Pacific Biosciences reads were used to further scaffold the N. rustica assembly. The repeat contents of the genome assemblies were estimated using RepeatMasker (http://www.repeatmasker.org) with the eudicot repeat library available from the Sol Genomics Network, the TIGR Solanaceae repeat library and a RepeatScout (https://bix.ucsd.edu/repeatscout) library created using sequences of at least 150 kb from the draft genome assembly. The classification of the repeat types was performed using hits to known repeat elements achieved by a BLASTN algorithm-based search. The completeness of the genomes was assessed using Benchmarking Universal Single-Copy Orthologs (BUSCO, http://busco.ezlab.org) with the embryophyta plant dataset consisting of 1440 universal single-copy orthologs. In addition, the numbers of unique ITAG 2.3 and TAIR 10 proteins mapping to the Nicotiana genomes were determined using BLAT (http://www.kentinformatics.com) with cutoffs of 80% coverage and 80% identity for ITAG 2.3 or 60% identify for TAIR 10 (Additional file 2: Table S4). For N. rustica, two transcriptomes were generated. The first transcriptome used RNA-seq data from eight tissues (flower bud, flower mature, capsule mature, leaf upper, leaf middle, leaf lower, root and stem) and aimed at producing a functional coverage across the tissues. In addition, to compare N. rustica with its progenitors using transcriptomes generated under similar conditions, a second transcriptome was generated using three tissues at two time points under two different growing conditions. Comparable samples were generated for all three putative progenitors. The samples included roots and lower and upper leaves from pre-flowering plants grown in the greenhouse, roots and lower and upper leaves from pre-flowering plants grown in the field, and roots and lower and upper leaves and flowers from flowering plants grown in the greenhouse (Additional file 6: Figure S5). Total RNA was extracted using the RNeasy Plant Mini Kit (Qiagen, Hilden, Germany). Libraries were generated using an Illumina TruSeq Stranded Kit and were sequenced on an Illumina HiSeq 2500. Reads were demultiplexed, and Trimmomatic (version 0.32) was used to remove Illumina adapters and trailing bases with a quality cutoff of 10, trim the reads and retain only paired reads with a minimum length of 50 bp. The reads were aligned using HISAT2 (https://ccb.jhu.edu/software/hisat2/index.shtml, version 2.0.1 beta). Aligned reads were filtered to include only reads flagged as PAIRED and to exclude reads flagged as SECONDARY, QCFAIL or SUPPLEMENTARY. Reads overshooting the scaffolds were removed by a custom script. For each individual sample and tissue, the mapped reads were assembled into transcripts, and these sample-wise transcript sets were then merged into a final set of transcripts using Cuffmerge (http://cole-trapnell-lab.github.io/cufflinks). Putative peptides were extracted by identifying the longest open reading frame in the transcript (Additional file 2: Tables S5–S6). Peptides sequences from N. rustica, its three putative progenitors and those of N. tabacum TN90 were clustered to determine the structures of the gene families using the OrthoMCL software (http://orthomcl.org). For each species, transcriptomes assembled using comparable read sets were used (three tissues/three condition set). Datasets were filtered and queried using a BLAST algorithm according to OrthoMCL requirements. OrthoMCL scripts were run, and the output was compiled into a Venn diagram using the gplots library for R.
OrthoMCL was further run using the sets described above and comparable proteomes from N. sylvestris and N. tomentosiformis, as well as tomato (ITAG 2.3, reference) as an outgroup. Core gene groups were chosen from the OrthoMCL clustering based on the criterion that each group should have two representative proteins in the cluster from the allotetraploids N. rustica and N. tabacum, and one representative from the remaining diploid species. Of the 12,401 ortholog groups, approximately half fulfilled this strict ortholog-only criterion (6315). For these clusters, the putative peptides were extracted and aligned using Muscle (http://www.drive5.com/muscle) . The alignments were trimmed to exclude 3′ and 5′ gapped regions, resulting in only the core consensus being included. From this set, all of the alignments were removed, of which more than 5% of the column had gaps in any one of the sequences, resulting in 3160 alignments. The alignments were used to generate a protein sequence-based phylogeny and estimate Ka/Ks rates. Inferring N. knightiana/N. paniculata ancestry based on shared ortholog protein groups. For the above clusters, phylogenetic trees were built, and the list of clusters was further filtered depending on the presence of a clear clustering in the cladogram of the gene variants to their ancestors. For example, there needs to be one N. tabacum protein corresponding to one N. sylvestris, one N. tabacum protein clustering with one N. tomentosiformis protein, one N. rustica protein with one N. undulata protein and one N. rustica clustering closest to N. knightiana/N. paniculata. Using the clustering information, the closest neighbor was determined for the this N. rustica protein. This could be N. knightiana, N. paniculata or the common ancestor of both. The number of occurrences of each assignment was counted. Philip Morris Products S.A. was the sole source of funding for this project. No other grants from funding agencies in the public, commercial, or not-for-profit sectors were received. Sequence data for Nicotiana rustica have been deposited in the DDBJ/EMBL/GenBank nucleotide core database at BioProject PRJNA335601. The assembled genome has been deposited with the accession number MDKG00000000. Illumina reads are available under accession numbers SRR8173839-SRR8173851 (DNA-seq) and SRR8169773-SRR8169836 (RNA-seq). Sequence data for Nicotiana undulata have been deposited in the DDBJ/EMBL/GenBank nucleotide core database at BioProject PRJNA335602. The assembled genome has been deposited with the accession number MDKH00000000. Illumina reads are available under accession numbers SRR8173251-SRR8173255 (DNA-seq) and SRR8169524-SRR8169558 (RNA-seq). Sequence data for Nicotiana paniculata have been deposited in the DDBJ/EMBL/GenBank nucleotide core database at BioProject PRJNA335603. The assembled genome has been deposited with the accession number MDKI00000000. Illumina reads are available under accession numbers SRR8173256-SRR8173261 (DNA-seq) and SRR8169598-SRR8169634 (RNA-seq). Sequence data for Nicotiana knightiana have been deposited in the DDBJ/EMBL/GenBank nucleotide core database at BioProject PRJNA335604. The assembled genome has been deposited with the accession number MDKJ00000000. Illumina reads are available under accession numbers SRR8169719-SRR8169728 (DNA-seq) and SRR8169559-SRR8169597 (RNA-seq). Protein sequences of the genes and key regulators of the alkaloid pathway are available in Additional file 7: File S1. NS, NVI and MCP conceived and designed the study. HB, HL, AV provided plant material and LB, VL and SG contributed to the biological interpretation of the results. SO and JT prepared the sequencing libraries and performed the sequencing. GL performed the elemental analysis and the LC-UV/MS analysis. NS and JNDB carried out genome and transcriptome analysis. NS, JNDB, LB, VL and NVI wrote the manuscript. NVI supervised the study. All authors read and approved the final manuscript. N. rustica L. var. Brasilia No. 7 (PI 499174, TR13, USDA–GRIN database), N. paniculata L. (PI 555545, TW 99, USDA–GRIN database), N. knightiana Goodsp. (PI 555527, TW 73, USDA–GRIN database), N. undulata Ruiz & Pav. (PI 555575, TW 146, USDA–GRIN database), N. tabacum L. cv. TN90 (PI 543792, TC 586, USDA–GRIN database), N. sylvestris Speg. & Comes (PI 555569, TW 136, USDA–GRIN database) and N. tomentosiformis Goodsp. (PI 555572, TW 142, USDA–GRIN database) were used in the experiments. Dedicated field studies were conducted in accordance with local legislation. All authors are employees of or contracted by Philip Morris Products S.A. (part of Philip Morris International group of companies). Kumar S, Trivedi PK. Glutathione S-transferases: role in combating abiotic stresses including arsenic detoxification in plants. Front Plant Sci. 2018;9. https://doi.org/10.3389/fpls.2018.00751.